The Sports Journalists’ Association is delighted to announce that it has joined forces with Canon UK in promoting the British Sports Photography Awards 2017, the most prestigious sports photography competition in the UK. 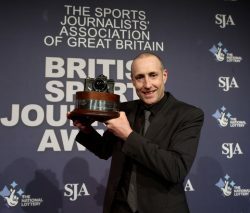 The competition, open to all British-based professional photographers, forms part of the British Sports Journalism Awards, sponsored by The National Lottery. Started in the late 1970s and running continuously for the past 40 years, previous winners include legends of the business Chris Smith, Eamon McCabe, Patrick Eagar and Bob Martin. Jakki Moores, Press-Segment Manager-Canon UK Ltd said: “Canon UK is delighted to sponsor the Sports Portfolio of the Year and Sports Photographer of the Year at the 2017 SJA Awards. “Canon is an industry leader in imaging technology and is dedicated to supporting professional photographers in the field and at major sports events across the world. “With unrivalled knowledge of the industry, Canon provides a complete solution to sports photographers’ needs to ensure they capture the stories that need to be told. The 2016 winner was Alex Livesey of Getty Images (left) , his moving picture of the Brownlee brothers just one from an impressive portfolio. Entry forms for the Sports Photographer of the Year Awards are available from this week and entries are welcomed in six categories, including specialist sports portfolio, football portfolio, sports picture and a new category for pictures taken “away from the action”.